This sweet RomCom, directed by Michael Showalter [Giles Vanderhoot (2016), Hello, My Name is Doris (2015)] is also an impressive drama which is original and diverse, dealing with culture clash amongst other issues. Actor and comedian Kumail Nanjiani and writer Emily V. Gordon have plundered their own life story for poignant and refreshing insights, resulting in a film packed with heart-searching moments and witty humour. Produced by Judd Apatow (Bridesmaids, Knocked Up, Trainwreck), The Big Sick is one of the hits of the summer, thanks in large part to its Silicon Valley star Kumail Nanjiani. He plays Pakistan-born Uber driver and aspiring comedian Kumail, who connects with grad student Emily (Zoe Kazan) after one of his stand-up sets. What they thought would be just a one-night stand blossoms into the real thing. But this complicates Kumail’s life with his traditional Muslim parents. When he visits for dinner, father Azmat (Anupam Kher) and mother Sharmeen (Zenobia Shroff) line up suitable marriage partners. His brother Naveed (Adeel Akhtar) counsels against his marrying a non- Pakistani. 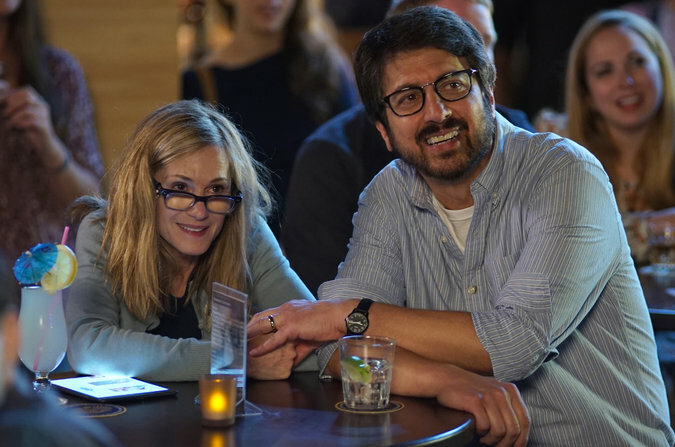 Then Emily is beset with a mystery illness and put into a medically-induced coma forcing Kumail to navigate the medical crisis with her parents, Beth (Holly Hunter) and Terry (Ray Romano) whom he’s never met, while dealing with the emotional tug-of-war between his family and his heart. Amid superb ensemble playing, there are standout performances from Holly Hunter [Manglehorn (2014), Top of the Lake (TV, 2013), The Piano (1993) and from Everybody Loves Raymond star, Ray Romano. This is an important, socially relevant, charming film, which successfully avoids genre clichés. Don’t miss the closing credits, featuring pictures of the real couple Kumail and Emily V Gordon at their traditional Pakistani wedding, with Kumail’s parents and brother.